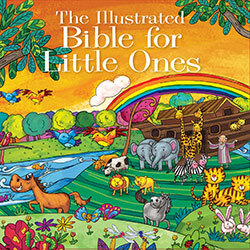 Introduce your little one (ages 5 and under) to the Bible with this brightly illustrated, easy-to-understand storybook. With more than a hundred adventure-filled stories from both the Old and New Testaments, The Illustrated Bible for Little Ones is sure to become the most requested book on your child’s bookshelf. As you read, your child will be captivated by the large, colorful pictures while learning who God is and how much He loves them. This is the one. This is the beginner Bible storybook you will want to give to inspire the children in your life as they begin their own journey with God.